The Salem Trip -- Post 2 "The Betties Rule"
Salem Trip -- Post 1 "The Witch School Interview"
In a rare moment of harmony, Magic the Cat and her brother Mystic agree that they approve of both the new couch and the anti-fur and dropped-food comfy cover I bought for it. And yes, Lisa, I bought crimson cushions, just for you! What? You expected a man? I'm a 51 year-old Witch living in the middle of nowhere with 5 cats. Let's face it, the odds are not in my favor. But this guy is pretty cute. Maybe I should kiss him and see if he turns into a prince. Nah--a prince would just expect me to do his laundry. Everyone knows Magic the Cat (Queen of the Universe), my co-author on the two Everyday Witch A to Z books. But not everyone has met her brother Mystic (the Magnificent). 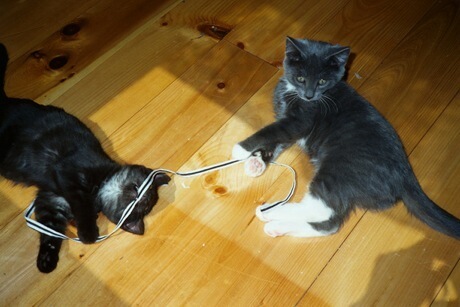 When they were kittens, Magic and Mystic were the same size, as you can see from the photo below. But Mystic just kept growing. Magic is about 11 lbs; fairly average for a cat. Mystic hit over 18 lbs at one point. Since going on a diet, he is at a nice, healthy 16.8 or so. And he's not fat--he's just HUGE. His shoulders are a good inch or two above the other cats. Luckily, he is mostly, well, a pussycat, with a very mellow nature. Except when if comes to tiny 7 lb Samhain, who for some reason he has disliked since the moment I adopted her. I have to keep them apart, or he tried to murdalize her. No idea why. I read a lot of books on Witchcraft, but rarely is there one that I love so much that I will publicly recommend it. I am breaking with that tradition now, because I found a book that so impressed me, I immediately bought copies for everyone in my coven, Blue Moon Circle. Together, we will be reading, studying, and discussing it over the course of the year. The book is called THE WITCH'S BAG OF TRICKS, and I met its author, Melanie Marquis at Pantheacon this year. It was her first appearance as an author, and she didn't even have a copy of the book yet, since it isn't officially out until June. She was such a sweetheart, we kept in touch via Facebook after the con, and after some hesitation, I offered to read the book and write a cover blurb for it if I liked it. No promises, but other established authors had been kind enough to do this for me when I first got started, and this felt like a good opportunity to pass on that kind of help. And I am so glad I did! The book is amazing--so deep and smart and yet still accessable. You're not going to be able to read this in one sitting; take the time to devour one chapter, think over all she talks about, then go on to the next. This is a must-read for any witch that has been practicing for a while, and starting to think...what now? I asked Melanie to come and talk about her book. So with no further ado, here is the author of the book I am recommending with all my heart. Does your Magick Measure Up? Our magickal rituals are meant to be enriching, transformative experiences that have a real effect on both our inner world and the world at large. When our rituals become routine, however, it's easy to switch from active participant to automatic bystander, simply going through the motions without really feeling (or working) the magick. As this rut develops gradually over time, it can be hard to realize just how deep of a hole we're getting ourselves into. A failed spell, a backfiring charm, an empty and unfulfilling sabbat ceremony—when our magick has been a bit mediocre, we can lose faith fast. We begin to doubt our abilities and we may even hesitate to use them. If this sounds familiar, look up! It's very possible to recharge your magick and refresh your spirit, and it's a journey you'll likely enjoy. In fact, it's a journey you will likely never end, as continued progress is the true key to satisfying, effective magick. Designing your own road forward is what my new book The Witch's Bag of Tricks (June 2011, Llewellyn Publications) is all about. I believe we have not only an ability, but a duty, to make our magick the best it can possibly be. If your magick has been any less than fabulous, finding new ways to shake up your routine will help you regain the sparkle fast. One helpful technique to put a fresh spin on your spellwork is to test and track your magickal activity. Don't just cast spells. Take notes, experiment, record results, and evaluate your magick. Try performing several spells with the same goal, a week or so apart, and see which sort of spell works best for you. For example, you might cast a prosperity spell using a candle as the main focal point, envisioning the growing flame of wealth. If the spell yields no results within whatever time period you specify, try another method, perhaps using a tarot card as a wealth-bringing talisman. If you still have no results, try a spell using image magick. Note what spells give you the best results. Another exercise to try tests your banishing magick ability. Try this the next time you have some really hard-to-wash pans to scrub. Perform a banishing charm on one side of the pan, using a blast of psychic energy to separate the layer of crud and direct it away from the pan's surface. Now scrub each side of the pan in equal measure, using the sponge with a uniform pressure. Which side cleans easiest? Did your banishing charm have any effect, or could your charmswork use some polishing? What other experiments can you think of? Testing our magick and tracking results, noting successes and failures alike, allows us to see the “big picture” of our magickal development. Once we collect enough data from our magickal “experiments,” larger patterns become apparent. We're aware of strengths we can utilize and weaknesses on which to work. We're inspired to further our learning and empowered to make the most of our magick, which in turn, makes our magick more exciting, fulfilling, successful, and fun. Here's the thing about joy--it often finds you unexpectedly; coming out of nowhere when you least expect it. The trick, I have found, is to be paying attention, and to grab it when it is floating by. I found joy in the strangest place today; I found it in a chair. A red chair, to be specific. No--I'm not kidding. A chair. I decided, a few days ago, that I might take a bit of the money I inherited from my grandmother (Germambie, who as many of you know I lost back in February) and buy myself a new couch. She was a big one for joy, my grandmother. She lived and breathed it, in fact. But that's besides the point. The point is, I have an old couch that I've re-covered, and stapled back together, and duct taped underneath so the cat couldn't climb up inside (Samhain, I'm looking at YOU). And I thought maybe I would finally go looking for a new one. Haven't found one yet. Instead, I found this. Yes. It's a chair. A recliner, actually. And it is RED. Mind you, this isn't a great picture, and it is more of a wine-red than this shows. But still. Red. I'm a woman who lives in a house where most of the walls are a nice mellow cream color. Whose tastes run to neutrals like black and brown and maybe a touch of slate blue/gray. And this chair is RED. And when I saw it in the store, it caught my eye. I thought about it for two days, and tried to talk myself out of it. "Self," I said. "It's red. Not tan. Not black. RED." And my self said, "Don't care. Want it. JOY." And so today, I went back and I bought it. And you know what? It makes me happy. This red chair, sitting in my living room, minding its own business and getting ready to collect cat hair in various shades of black and gray and even orange (I'm looking at you, Samhain). Why? Because it is comfortable, and fits in the space, and I can use it to write in. And because, for some inexplicable reason, it brings me joy. And joy is nothing to pass up, when it comes to you. Even if it is RED. Clearly Angus agrees. Yay. Yellow cat fur. What was I thinking? Oh, that's right--joy. Red chair joy. What unexpected thing brought you joy? Really--I want to know. I added a new widget a couple of weeks ago--one which tells me how many views the blog has had. I confess--the number was WAY higher than I expected. Not only does this make me feel, well, kinda warm and fuzzy inside (people are interested in what I have to say? really?) but it also gives me a sense of responsibility. So thank you for being among the ten thousand. Cookies for everyone! Magic the Cat, doing her best to look spooky for Friday the 13th. She's doing a pretty good job, don't you think? And don't forget, only two more days to sign up for my "Witchcraft for the Paranormal Author" online workshop over at www.savvyauthors.com . It starts on the 16th, and Magic will be supervising my every move, as usual. I hope to see you there! Mother's are kinda important. After all, none of us would be here without them. But more than that, we are who we are as adults at least in part because of what we learned from our mothers. My mother is a brilliant professional who showed me that a woman could succeed (and excel, even) in a man's world. And she is a fabulous writer who was my first reader on my first book (and did lots of edits so I looked a lot smarter than I am). So thank you, Mom, for everything you did and do for me. I love you. Happy Mother's Day. And yes--I cleaned my room. I am giving my popular writing workshop, "Witchcraft for the Paranormal Author," over at SavvyAuthors starting on May 16th. This is the last time I'm giving it this year (or possibly for a couple of years), so if you're at all interested, you might want to go sign up! A tome is where the heart is: The Goddess is in the Details: "The Goddess is in the Details: Wisdom for the Everyday Witch by Deborah Blake ISBN: 978-0-7387-1486-8 228 Pages Synopsis: Deborah B..."
Great review of my book! YAY! Meeting Lani in person was a real treat, and getting to hang out with her, honorary Betty-and-famous-author Anne Stuart (aka Krissie), and Betties Kate George (who ran the conference with aplomb and skill), Delia, and Megan was the icing on the cake. (Bacon-flavored, of course). There was a lot of laughter and some serious author talk along the way--watching Lani and Krissie giggle was practically worth the price of admission, all by itself. Betties rule. Thanks for sharing the adventure with me, ladies. Y'all are the bomb. My new post is up at the group blog, Black Ink, White Paper. I talk about writers need to read as much as they need to write. My trip to Salem was great, and I have lots to share (and plenty of pictures). Of course, I am so exhausted, I haven't even unpacked yet! So here is the interview I did with Don Lewis of The Witch School, who was kind enough to host a book signing for me, and take me on a personal tour of their museum.